You are here: Home » GABF: Custom T-Shirts or no Custom T-Shirts? GABF: Custom T-Shirts or no Custom T-Shirts? So as you may know, Don and I are going to be attending next month’s Great American Beer Fest for the first time. We’ve been putting our game plan together, trying to cram in as many meet-ups, schmoozes and (of course) great beers into the 48 hours we’ll be in Denver. Part of the plan is to get some t-shirts made up with the site on it. This will serve two purposes – one, it’ll make us more easily identifiable to folks who read the site, possibly eliminating some awkward moments. The other thing shirts will do is make it easy to say who we are – we can just point at a logo or the URLs on our bellies. Beyond that, I think the shirts are looking pretty cool so far, so they’ll be fun to wear as well. But I’m having second thoughts on whether or not it’s a good idea. Are we trying too hard? Will we look a little desperate for attention? Will they refuse to pour us beers when they discover who we are? All of these are real possibilities. So what do you think? T-shirts or no T-shirts? I’ve put the artwork for the shirts above so you can get an idea of what we’re thinking design-wise. Give it a click to enlarge. Also let us know if they’d be something you think folks might be interested in getting for themselves, as we might bring extra’s to GABF to share. To dork or not to dork – that is the question! 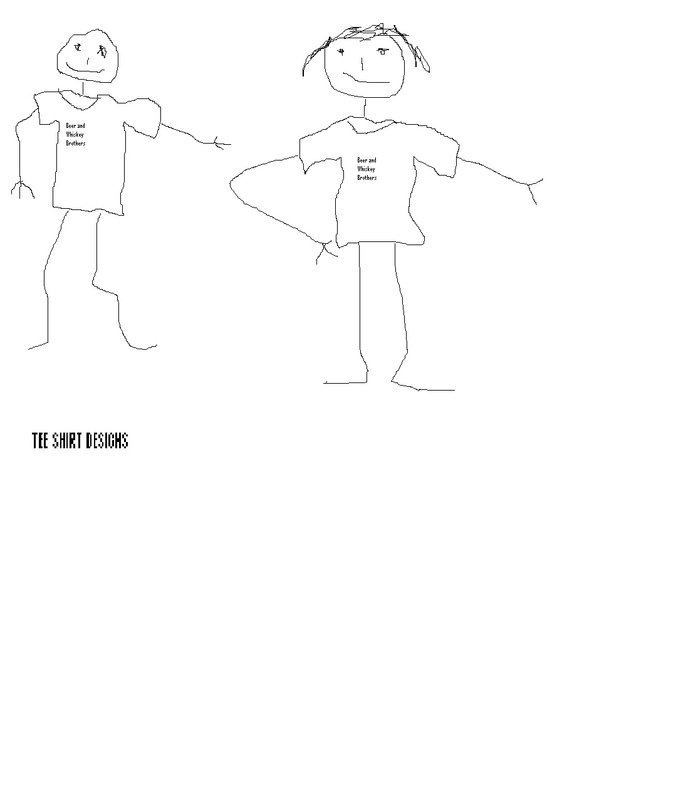 I had a Design for a tee shirt too, but Jim didn’t want to go with my design. I thnk he is jealous because I’m the Brother with all the talent. See what you think. Should we use my design? Be Proud!!! Wear your T-shirts! Yeah, let our colors fly? Thanks, Angela. I’m proud of the site and the other things we do, so I guess the sirts are an extension of that. I wasn’t sure if it’d make us look like bloggers from 2003. Nice work gentlemen! I say print some up and where ’em. If one person at GABF spots you because of your shirt or the shirt starts a conversation, it’s worth it. On a very minor design note, seems like one too many lines of type on the back. I know you want to feature the web address, but visually, I want to 86 it. Or maybe there just needs to be a smidge more leading between the tag line and the address so it doesn’t look like a single copy block. The blue shirt seems to have a bit more space between them, and I think I like it better. Let’s see some B&WB gear! I think you’re right – the goal is for folks to find us or meet us, and the shirts help. I just want to make sure they’re cool enough that they have “beer cred” and aren’t just bad logos on our bellies. Stop by the Wynkoop with a couple. The brewers need some new t-shirts for brewing! Dudes, wear them!!! Have you ever seen what some people wear to this thing? Its almost as wacky as a Star trek convention. If you decide to mass produce the t-shirts, let me know as I would love to buy one of each! I think it’ll be a photo rich environment for sure, Rob. I can’t wait to witness the mayhem! If they turn out cool enough and folks want them, we might sell them. although it goes against what seems like our mission: Spend money on beer, whiskey and the blog and don’t ever get anything in return! That’s all good but spreading the word is also what you guys are about. As @BeerPoet pointed out, starting a conversation from someone seeing one of your t-shirts is an awesome way to discuss the wonderful world of beer. Hasn’t that happened to you where you may be in a supermarket and someone approaches you because of a something you’re wearing? I know at the GABF its a whole different world and reason to have them. The supermarket conversations are usually sparked by me wearing a dress. I’ve gotten to know the security staff pretty well, which is nice. Cool designs, you come up with them Jim? My thoughts. I would just do the circle logo that you have on the back and stick it on the front, remove the other text besides the URL. Even better, replace the pictures of the glasses in the circle with a rendition of you guys (something like ben & jerry). I dunno. I think it would be a hoot to see you guys on a shirt. Whatever you decide, go with the shirts! You might end up in other people’s pictures or videos and it gets the name out. Yeah, I designed them, for better or worse. I thought about going logo-on-the-front, but as you can see from this post, I’m a little uptight about doing the standard t-shirt thing and wanted to make something that was cool on it’s own, hence the hop and the corn and a few other ideas we have baking. I vote for Don’s design!! Don’s design all the way!!! Yes, but one’s from me and you know I don’t mean it, and the other’s from Scott who is quite an evil person. Gee, I thought it was from the heart! See how you are? How about we do both and each wear our own design? Not really sure what happened. I find it curious on Don’s design where Jim’s hand is. Hopefully there isn’t a story related to this on the next podcast. The front is too busy with the quote. Put that on the back and then the corn or the hop. Thats two cents from the peanut Gallery. Nice logo! 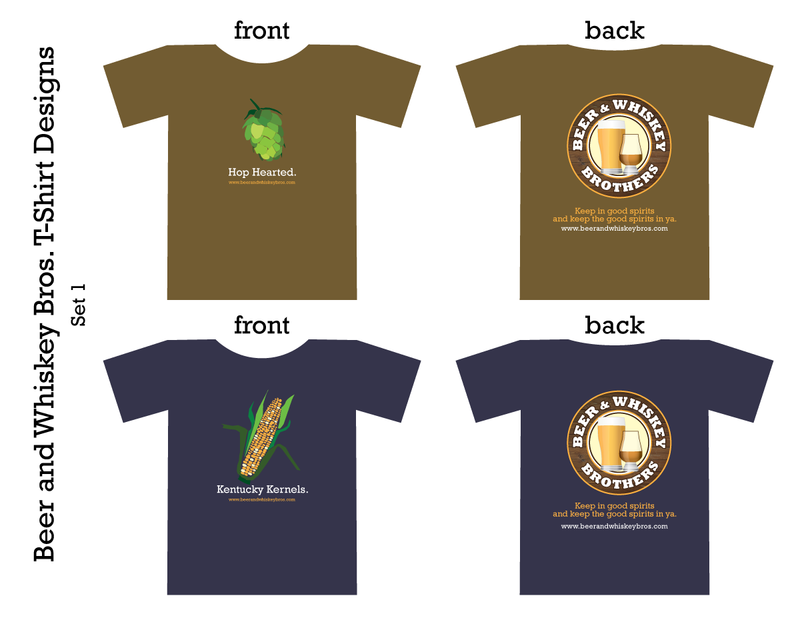 Then the next one you have a hop or the corn on the left breast and Beer and Whiskey Brothers on the back. You could do an entire line! Wait. How do we know which is Don and which is Jim? I’m so used to seeing Don in the clown makeup that I’m confused.